To create a contact page like in the demo, there are 2 things you must do. Each step is explained in more detail below. We have added a page template called “Contact Page” which is set up to display contact details, a contact form and a map. 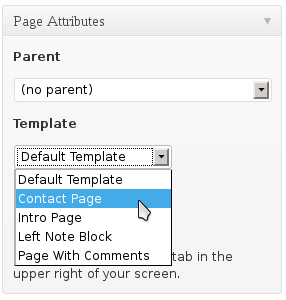 To create a page like this, add a new page in WordPress and at the right hand side there is a box named Page Attributes Under Page Template choose Contact Page. To configure your contact settings go to the theme options panel, then go to Contact → General. Fill out the fields with your settings and enter your map image or iframe HTML in the box. You should have already imported the contact form as described on the How to install page. At the Contact page template form setting select “Contact Form” from the list. If it’s not there, go to the Setting up the contact & register forms page and import the contact form, then go back to the theme options panel and select the contact form.